Welcome back, my novice hackers! As all of you know, reconnaissance is critical to being successful in a pentest or hack. Recon is where we gather all the information we need to determine the best strategy for hacking. Without good recon, we are likely to waste many hours and be unsuccessful. Professional hackers know that good recon is key to success. Of course, the first step is to fire up Kali. In this case, I will be using Kali 2.0 as Sparta is already built in. Go to Applications -> Information Gathering -> sparta. When you click on it, a GUI like that below will open. 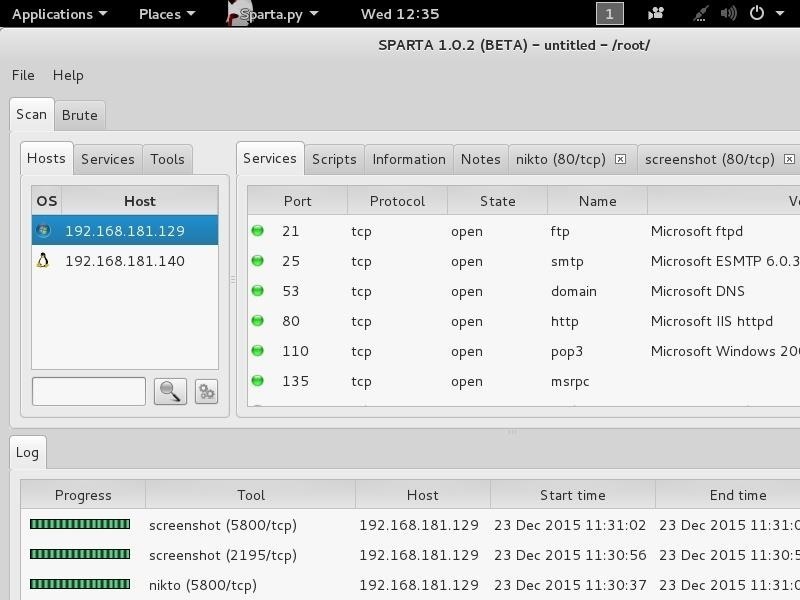 To get started with Sparta, we need to provide it with hosts to scan and enumerate. If we click on the space that says "Click here to add host(s) to scope," it opens a window where we can add the IP addresses or the range of IP addresses to scan. We are also able to use CIDR notation to indicate an entire subnet such as 192.168.181.0/24. After adding our IP host range in the Window, click "Add to scope." Sparta will start scanning your hosts now. When Sparta is done scanning, it will provide you results like that below. My subnet had only two machines on it. 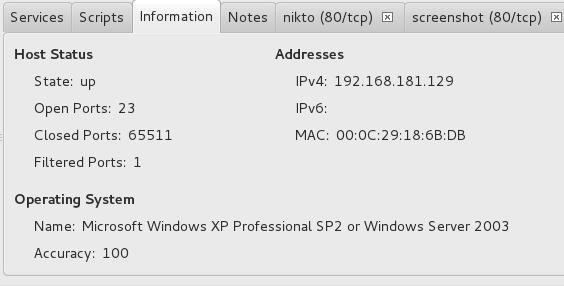 As you can see, Sparta identified those two IP addresses and provided OS fingerprinting, identifying one as Linux and one as Windows. When I highlight the Windows system IP, it provides details of all the ports it found open and the services running. If we go the "Information" tab, we can get more detailed information on the particular highlighted system. Notice at the bottom of this screen that we get more specific information on the operating system of the target. Interestingly, Sparta also runs a Nikto scan on the system if it finds port 80 open. We can click on the "nikto" tab to see results of the nikto web app vulnerability scan. Sparta can also brute-force passwords. Using Hydra, you can specify the IP, port, and service, then brute-force it. 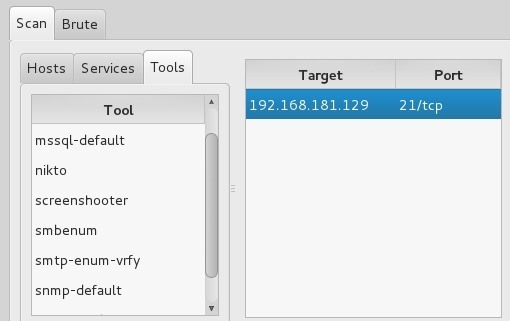 For those who want a single scanning and enumeration tool with an easy-to-use GUI, Sparta is the perfect reconnaissance tool. In this tutorial, I introduced you to the basics of this tool, but because it integrates so many tools into one, it will require additional tutorials to demonstrate all its capabilities. On the other hand, because it is relatively intuitive, many of you should be able to decipher its capabilities by just playing with it a bit. In any case, Sparta is one more excellent tool in our reconnaissance toolset. Keep coming back, my novice hackers, as we explore the tools and techniques of the most important skill set of the 21st century—hacking! its pretty cool but its just the same as the auto-exploiter i made in one of my tutorials, i never heard bout this tool before but i could easily make a similar one, buy anyway nice sharing..
Off topic though but was about to post a thread on this. Ok so I basically cannot send messages and its because my email is not verified which is another problem because I don't exactly remember the last time I requested for an email update after verifing it for the first time but all the same, the verification link after I request a new one to verify my account is always between the wonderhowto domain and my email server, it never gets to my account. Can you please help me out on this ? its still cool tutorial but personally i dont like the fact that the master OTW most of the time promote or motivate the use of GUI tools, specially for beginners, its better when they start messing with the commands line, terminal tools run faster and if not all, the majority are open source..when they learn to hack by simple clicks they become lazy(i experienced it).. I agree with you, but as you said, you started using a GUI. Most of my tutorials are command line, but with the influx of newcomers, I have offered some GUI based tools when they work well. why exactly don't you like kali 2.0? This is quite the coincidence, I was just messing around with Sparta for the first time a few days ago. I'm glad to see it's worth the time! Please message me. I wanna discuss something with you. Alright. I'll send you an invite. I noticed in the sparta.conf that there are 6 different types of nmap scans listed. Any ideas what Sparta uses by default? Also, is Sparta recommended for when you're already in a network or when you're investigating a potential target? Or does it matter? Sparta uses the TCP connect scan by default (-sT). I tried Sparta to scan a unknown device (which was my internet radio) but sparta didn't show me any results. It just said all five scans are completed and then there was no result. With my main pc, sparta had no problem. Any workaround for internet radios? Or are these "no results" a sign for a internet radio? Remember that Sparta is a tool for convenience, simply incorporating several tools into a single GUI. It is likely that the nmap ping is being blocked. Try scanning it with nmap and suppress the ping (PN).